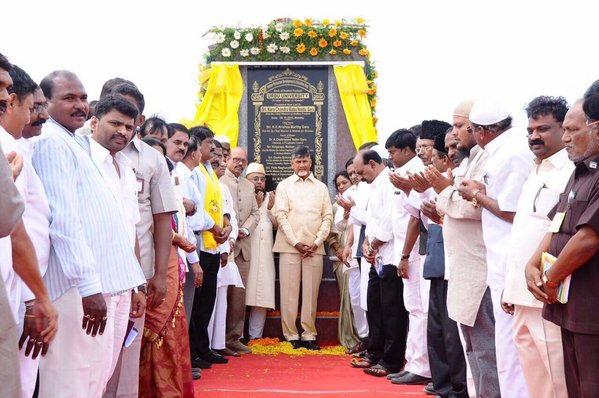 Andhra Pradesh Chief Minister N. Chandrababu Naidu on Monday laid the foundation stone for a Urdu university in Kurnool district, and said his government has taken a major step for the development of the language by deciding to set up the institution. The university is coming up in Urvakallu on 125 acres of land at an estimated cost of Rs.20 crore. Kurnool district in Rayalseema region has the highest concentration of Muslims in the state. On the occasion, Naidu said Urdu was not only being treated as the second official language in the state but the government has also taken a major step for the development of the language by deciding to set up the university. Naidu said the university would help in educational development of students from minority community and create employment opportunities. Recalling the role played by him in setting up of the Moulana Azad National Urdu University in Hyderabad, the chief minister said his government would ensure development of minorities at par with other communities. Naidu said the government was giving top priority to development of Urdu and welfare of minorities. Under the 'Dulhan' scheme, a financial assistance of Rs.50,000 is being given for marriage of poor Muslim girls. The chief minister said an education hub would be established over 900 acres in Kurnool. He said Visakhapatnam, Amaravati and Kurnool would be developed as three educational hubs in the state.